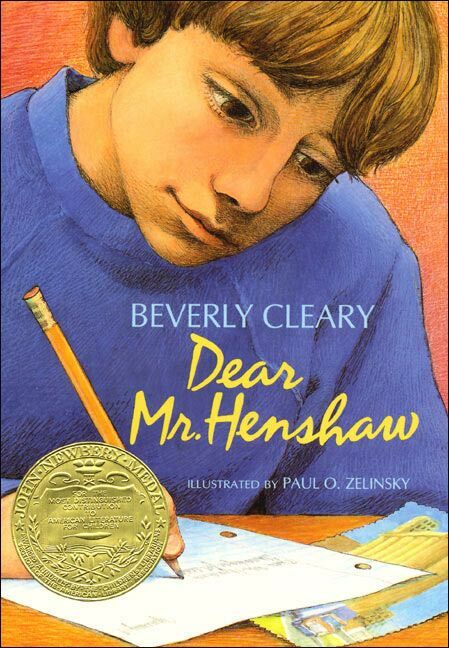 Dear Mr. Henshaw is a classic middle grades chapter book that kids love today just as much as they did two decades ago when it first came out and became that year's Newbery Medal winner. In the story, second-grader Leigh's favorite book is Ways to Amuse a Dog by Boyd Henshaw, so he writes to the author to let him know that he "licked" the book. This one letter becomes the first of many over the next few years, until the busy author suggests to Leigh that he keep a journal. Leigh wants to be a writer too, so follows Mr. Henshaw's advice, and the letters turn into a journal--with entries addressed to "Dear Mr. Pretend Henshaw", since Leigh feels better if he's writing to someone. The format is clever, told through a combination of Leigh's letters to Mr. Henshaw and his journal entries to "Mr. Pretend Henshaw." This makes Dear Mr Henshaw a good choice for reading aloud to your class when trying to inspire students in either of these writing modes. Cleary covers a number of different personal and family issues that many students will be able to relate to. In his journal, Leigh writes about his parents' divorce and how much he misses his dad. He also talks about not having many friends at school and the problems he is having with students stealing food from his lunch box. The voice feels authentic for a boy his age, and children experiencing family break-up or loneliness will certainly relate to this character and feel encouraged to watch Leigh come to understand and accept his family situation and even make a few friends.